Healthy Chinese chicken salad recipe is a refreshing crowd-pleasing dish. Tossed in tangy soy ginger dressing and packed with fresh vegetables in each bite. 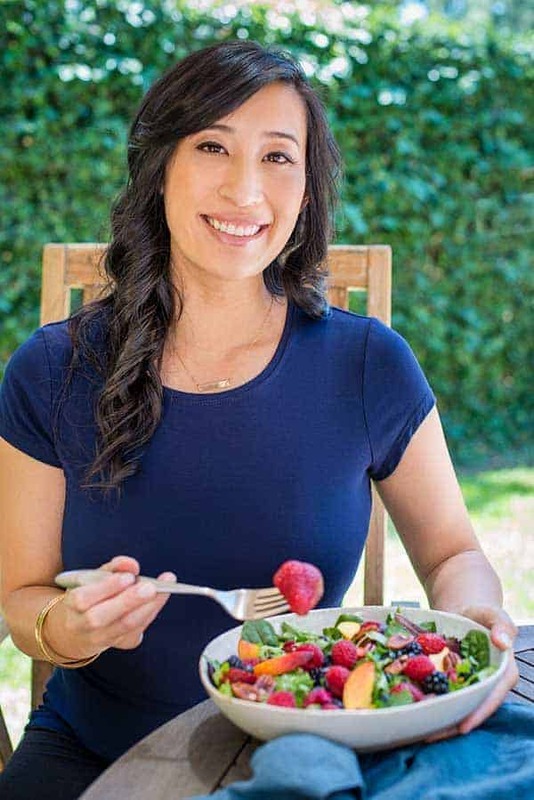 With Chinese New Years on the horizon, I prepared a healthy and delicious Chinese chicken salad recipe. 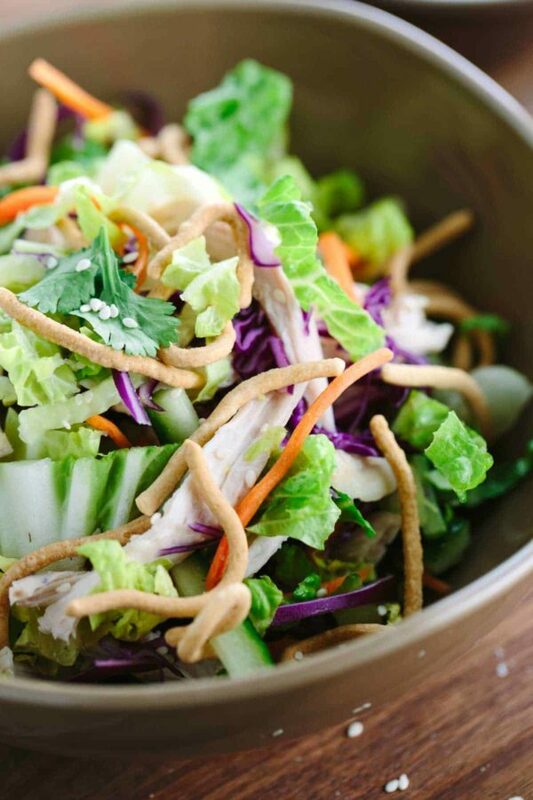 It’s packed with crunchy cabbage, lettuce, carrots, noodles and ginger poached chicken tossed in a tangy soy vinaigrette. Refreshing and satisfying, this is a great dish for any occasion. A quick weekday dinner, lunch for work or larger gatherings. Let’s get the festivities started! What makes this salad especially attractive and addicting is the tangy sweet soy dressing. If you haven’t made your own vinaigrette before, it’s so easy. If you’ve got a whisk handy and a little bit of mini-muscle, a dressing can come together in seconds! You could even add the dressing to a large mason jar and shake it up to burn a few extra calories, kids love to help too. I could just imagine baby James going nuts, dancing around and giggling with a shaker bottle of dressing splashing around inside. Have you tried poaching chicken before? It’s a delicate way to infuse flavor into the chicken through the cooking liquid. I used fresh ginger, garlic and a little bit of salt to flavor the water. 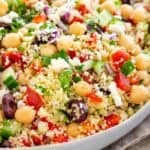 This technique is easy but also a healthy method of cooking that doesn’t require adding extra fat for cooking. Just helping you look after your waistlines (fist bump). If you have leftover grilled or roasted chicken, shred up the meat and add to the salad instead, easy peasy. This dressing was inspired by RecipeTin Eats. 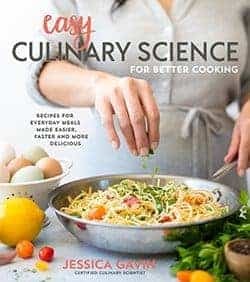 She does such an excellent job making gourmet meals simple for home cooks. The base of the dressing is equal parts or soy sauce, rice vinegar, freshly minced ginger and garlic, sesame oil and some neutral grapeseed oil adds a little bit of richness. The spicy ginger and garlic add a “zing” to the dressing. I want to pour this over everything! Ready to dig in? I know, it’s hard to resist so much crunchy eye candy. If you can’t find the noodle topping, you can cut up slices of wonton wrappers and fry until golden brown and crispy. If you are not serving this salad right away, toss together the salad ingredients but wait to add the dressing. The dressing is a temporary emulsion, and it will separate over time. Not to worry, just whisk together or shake in a jar right before dressing the salad. I can’t wait to hear how you liked this recipe or let me know what you ate to celebrate Chinese New Years! If you make this recipe, please let me know! Leave a comment, rate it, and don’t forget to tag a photo #jessicagavin on Instagram. I’d love to see what you come up with. Cheers, friends! What is the benefit of poaching foods? Delicate foods like eggs, chicken breast, fruit, and fish benefit from using a gentle cooking method called poaching. The food cooks in a pot of liquid that is well below the boiling point (212°F). For this recipe, the chicken is covered with water to 1-inch above the meat. This provides an efficient cooking liquid that cooks the chicken on both sides and prevents the surface from drying out. You can cover the pot with a lid to have a constant gentle cooking environment, but make sure that the temperature is kept low enough, so it does not start boiling (170 to 180°F). You want don’t want to see bubbles break the surface. That would be simmering. It’s helpful to use a digital thermometer handy to check the temperature of the water before adding the chicken, during cooking, and to verify that the chicken has reached 165°F. The food becomes very tender, moist infused with flavors if you choose. Place chicken in a pot just large enough to hold chicken breast halves and add enough water to cover by 1-inch. Add salt, ginger slices and garlic. Bring just to a simmer over medium-high heat when bubbles start forming around the edge of the pot. Reduce to medium-low to keep the temperature constant, about 170 to 180°F. Cook chicken until the center of the meat reaches 165°F on an instant-read thermometer, 20 to 23 minutes. Transfer to a plate, and let the chicken breasts cool in the refrigerator. Once cool, shred chicken and reserve. In a medium-sized bowl combine soy sauce, vinegar, sugar, ginger, garlic, and pepper. Slowly whisk in sesame and grapeseed oil. If you have a blender, you can combine all vinaigrette ingredients together for a few seconds until mixed well. Set aside for 10 minutes or so for the flavors to meld. Place the salad ingredients together in a large bowl, except crunchy noodles and sesame seeds. Whisk dressing if layers have separated. Drizzle over dressing then toss. Top with noodles and sesame seeds. Serve immediately. Some of the links above are affiliate links, which pay me a small commission for my referral at no extra cost to you! Thank you for supporting my website. This looks wonderfull! Yummed and pinned, too! All my favorite flavors–I could live on this for days. I poach the chicken in chicken stock to give it a bid of flavour. Since I’m going easy in the carbs and fat – I’ve omitted the crunchy noodles and sesame seeds as well as omitting the 2 tablespoons of grape seed/neutral flavoured oil. Still tastes great and fresh. My wife and I could eat this every day!